Great location. Steps to the downtown Gatlinburg, but located on a quiet street. Great stay! The location is perfectly in the town center but it's quiet. We stayed at the 4th floor room with a nice balcony. The room is spacy and recently redecorated. There are 2 sinks, one inside bathroom, another near the door, that is a very nice feature if you come with a family. Where to find Gatlinburg hotels near an airport? 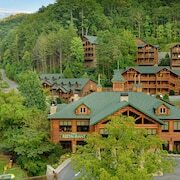 Where can I find hotels in Gatlinburg that are near tourist attractions? Visitors can discover an extensive selection of apartment and hotel options to choose from in Gatlinburg. Expedia's comprehensive database lists 117 hotels within a 0.1-kilometre (0.06-mile) radius of the center of Gatlinburg. Visitors wanting to find a hotel within 1 kilometre (0.6 miles) of downtown Gatlinburg, should check out the latest deals at the Holiday Inn Club Vacations Smoky Mountain Resort and The Park Vista - a DoubleTree by Hilton Gatlinburg. If you are looking to book a place to stay situated within easy walking distance of the Ripley's Aquarium of the Smokies, the The Lodge at Buckberry Creek and the Eight Gables Inn are good options. 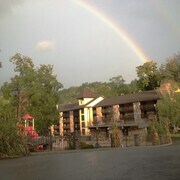 The The Lodge at Buckberry Creek is 2 kilometres (1 mile) away from the Ripley's Aquarium of the Smokies. The Eight Gables Inn is 2 kilometres (1 mile) away. If you have to be mindful of your budget and are hoping to find lower priced Gatlinburg hotels or apartments, there are quite a few economy places on offer in the vicinity. The Glenstone Lodge is 0.8 kilometres (0.5 miles) from the center of Gatlinburg, while the The Summit of Gatlinburg is 4 kilometres (3 miles) away. The Oak Square Condominiums and the Brookside Resort by FairBridge are two of the other recommended economical places worth checking out. 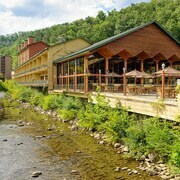 Check out the Creekwalk Inn and Cabins and also the Wyndham Vacation Resorts Great Smokies Lodge. 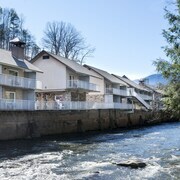 The Creekwalk Inn and Cabins is situated 30 kilometres (17 miles) away from the center of Gatlinburg. The Wyndham Vacation Resorts Great Smokies Lodge, is situated 20 kilometres (13 miles) away. Alternatively you could investigate the RiverStone Resort & Spa or the Christopher Place. Why don't you take the time to enjoy the many delights to be found in Eastern Tennessee while you are in the area? Eastern Tennessee has mountains and rolling hills. Commonly visited Eastern Tennessee tourist destinations are historic mansions. In this region of United States of America tourists might partake in mountain biking. 14 kilometres (9 miles) to the north of Gatlinburg you'll find Sevierville, where you can spend the day visiting Tanger Outlets and Sevierville Golf Club. 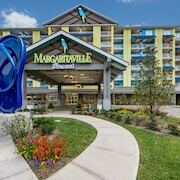 Some of our recommended Sevierville hotels include the River Place Condos and Wyndham Smoky Mountains. Or, you could stay in Pigeon Forge, 10 kilometres (6 miles) to the northwest of Gatlinburg, where you can choose from the Smokies Bed and Breakfast and Laurel Crest. The Dollywood and WonderWorks are some of the most popular points of interest to explore in Pigeon Forge. If you are planning on arriving or departing via McGhee Tyson Airport, you might like to book a bed at Hilton Knoxville Airport, or Courtyard Marriott Knox Airport, both of which are conveniently close. What are the most popular Gatlinburg hotels? Are there hotels in other cities near Gatlinburg? 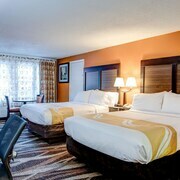 What other types of accommodations are available in Gatlinburg? Explore Gatlinburg with Expedia.ca’s Travel Guides to find the best flights, cars, holiday packages and more!